Irish t-shirt for women is a premium garment that features a sequined Irish design that includes a shamrock. This 100% combed cotton women's Irish t-shirt is not pre-washed and may shrink a size. This women's Irish t-shirt features 3/4 length sleeves and a soft top stitched rib knit V neck. 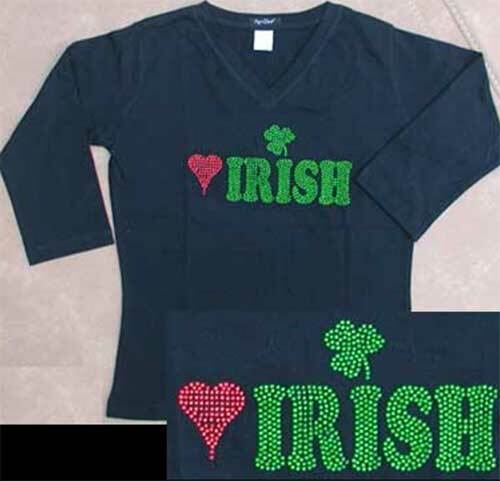 The Irish t-shirt for women is enhanced by a sequined green shamrock along with the the word Irish; the shirt is also accented with red sequined heart that proclaims your love for Ireland. The sleeves and bottom of this black t-shirt are double needle hemmed. This ladies shirt is received with a shamrock history card, complement of The Irish Gift House. This shirt is only available in size small. Irish t-shirt for women is a premium garment that features a sequined shamrock design.